Roger Federer was briefly refused entry to the player's area here in Melbourne on Saturday, after a stickler of a security guard spotted that the winner of 20 grand slam singles titles was not wearing his accreditation badge. Yesterday the great man suffered further indignity, as he found himself summarily ejected from the tournament. The culprit this time was Greece's Stefanos Tsitsipas (20) who produced a masterpiece of classical tennis to curtail Federer's sequence of 17 straight victories at the Australian Open. 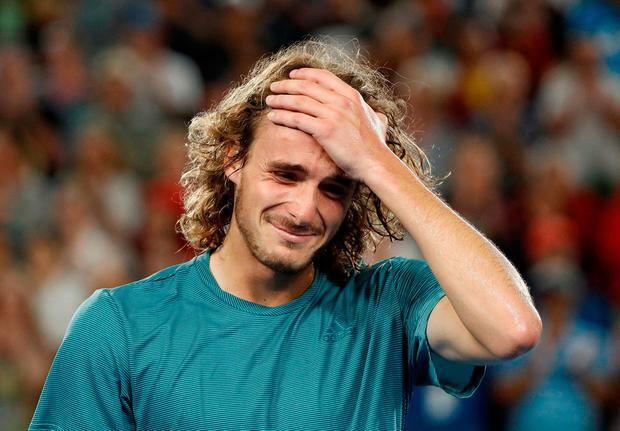 "I am the happiest man on Earth right now," an emotional Tsitsipas told John McEnroe in his on-court interview, while clutching his shoulder-length mane in disbelief. The result was a blow for Federer's legions of fans. But if we are thinking of the future, it is no bad thing that the man to oust him should have been Tsitsipas, a graceful performer whose instinctive volleys and one-handed backhand can only be described as Federer-esque. These two players have never faced each other before in a competitive match but it still felt like the master being surpassed by the apprentice. Physically, Tsitsipas is both explosive and elastic - a combination which soaks up the impact of these rock-hard courts, while his mental game was awe-inspiring. Federer applied huge pressure throughout, but Tsitsipas simply refused to crack, saving all 12 break points that he faced. Meanwhile, Federer's forehand - the peerless scalpel that has carved out the bulk of his 99 career titles - was losing its edge. "I have massive regrets," Federer said after his 6-7 7-6 7-5 7-6 defeat. "I felt like I had to win the second set (and that) cost me the game. I also didn't break him at the Hopman Cup (in a recent exhibition match that Federer won in two tie-break sets). So clearly something is wrong how I return him." Tsitsipas will probably have more power left in his legs than his quarter-final opponent Roberto Bautista Agut, whose five-set victory over Marin Cilic was his third such lung-buster in four matches. But he could wind up having to beat Nadal, who cruised through, and Novak Djokovic in successive matches. To take out all of the 'Big Three' would be all but impossible. Yesterday, Tsitsipas and Bautista Agut both earned their first appearance in the quarter-finals of a slam, and so did American Frances Tiafoe, who overcame Grigor Dimitrov with a stunning performance on his 21st birthday.